Posted On February 16, 2012 by &filed under Legal Articles. Urban centers in India are facing an ironical situation with regard to water today. On the one hand there is acute water scarcity and on the other, the streets are often flooded during the monsoons, reflecting managerial inefficiency of the urban local bodies to use the surplus water of the rainy season to overcome the deficiency in other seasons. The shortage of ground water is more pronounced due to urbanization and limited open areas available for recharge of ground water. In some cities the ground water extraction has reached very high levels and has brought problems like declining water table, failure of wells/ tube wells and deterioration in ground water quality and quantity. Water is more often been seen as a cause for social conflicts, protests, demonstrations and road- blockades. In the given situation rain water harvesting can prove to be a solution for overcoming this scenario. Rain Water Harvesting (RWH) has been in practice for more than 4000 years owing to the temporal and spatial variability of rainfall, in its broadest sense, a technique used for collecting and storing rainwater for human use from roof tops, land surfaces of rock catchments. Simply stated a water harvesting system collects and stores water within accessible distance of its place of use. The physical and chemical properties of rainwater are generally superior to the sources of groundwater that may have been subjected to contamination. Like other water resources, rain water harvesting is an option to be considered when planning for a community oriented water supply system. Depending on local environmental conditions, water harvesting may provide a supplementary supply, an alternative supply or the only feasible improved supply, especially in urban areas. The current centralized water supply paradigm seems unsustainable and extremely high on energy consumption. As an alternative paradigm for more sustainable water availability harvesting rainwater, storing it in tanks, and recharging groundwater may be put in place. The first step could be to initiate domestic rooftop rainwater harvesting. In a house the highest point is the rooftop. However, common property resource issues have to be considered at larger level for rain water harvesting. The govt. has issued policy directives for encouraging this practice. 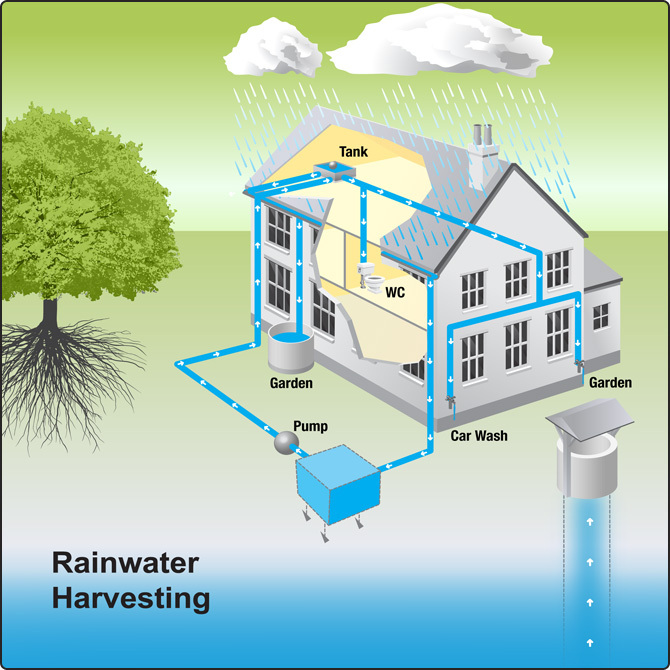 Rainwater harvesting is the gathering, or accumulating and storing, of rainwater. Rainwater harvesting has been used to provide drinking water, water for livestock, water for irrigation or to refill aquifers in a process called groundwater recharge. Rainwater collected from the roofs of houses, tents and local institutions, or from specially prepared areas of ground, can make an important contribution to drinking water. In some cases, rainwater may be the only available, or economical, water source. Rainwater systems are simple to construct from inexpensive local materials, and are potentially successful in most habitable locations. Roof rainwater is usually of good quality and does not require treatment before consumption. Household rainfall catchments systems are appropriate in areas with an average rainfall greater than 200mm per year, and no other accessible water sources (Skinner and Cotton, 1992). There are a number of types of systems to harvest rainwater ranging from very simple to the complex industrial systems. Generally, rainwater is either harvested from the ground or from a roof. The rate at which water can be collected from either system is dependent on the plan area of the system, its efficiency, and the intensity of rainfall. Basically rain water harvesting is the principle of collecting and using precipitation from a catchments surface. An old technology is gaining popularity in a new way. Rain water harvesting is enjoying a renaissance of sorts in the world, but it traces its history to biblical times. Extensive rain water harvesting apparatus existed 4000 years ago in the Palestine and Greece. In ancient Rome, residences were built with individual cisterns and paved courtyards to capture rain water to augment water from city’s aqueducts. As early as the third millennium BC, farming communities in Baluchistan and Kutch impounded rain water and used it for irrigation dams. Roof catchments systems channel rainwater that falls onto a roof into storage via a system of gutters and pipes. The first flush of rainwater after a dry season should be allowed to run to waste as it will be contaminated with dust, bird droppings etc. Roof gutters should have sufficient incline to avoid standing water. They must be strong enough, and large enough to carry peak flows. Storage tanks should be covered to prevent mosquito breeding and to reduce evaporation losses, contamination and algal growth. Rainwater harvesting systems require regular maintenance and cleaning to keep the system hygienic and in good working order. Ground catchments systems channel water from a prepared catchment area into storage. Generally they are only considered in areas where rainwater is very scarce and other sources of water are not available. They are more suited to small communities than individual families. If properly designed, ground catchments can collect large quantities of rainwater. A subsurface dyke is built in an aquifer to obstruct the natural flow of groundwater, thereby raising the groundwater level and increasing the amount of water stored in the aquifer. The subsurface dyke at Krishi Vigyan Kendra, Kannur under Kerala Agricultural University with the support of ICAR, has become an effective method for ground water conservation by means of rain water harvesting technologies. The sub-surface dyke has demonstrated that it is a feasible method for conserving and exploiting the groundwater resources of the Kerala state of India. The dyke is now the largest rainwater harvesting system in that region. Rainwater may also be used for groundwater recharge, where the runoff on the ground is collected and allowed to be absorbed, adding to the groundwater. In the US, rooftop rainwater is collected and stored in sump. In India this includes Bawdis and johads, or ponds which collect the run-off from small streams in wide area. In India, reservoirs called tankas were used to store water; typically they were shallow with mud walls. Ancient tankas still exist in some places. 1. Surface water is inadequate to meet our demand and we have to depend on ground water. 2. Due to rapid urbanization, infiltration of the rain water into the sub-soil has decreased drastically and recharging of ground water has diminished. people would go a long way in improving the ground water levels in the states as well as in meeting the immediate requirements of the people for fresh water. Considerable success has been achieved in propagating the beneficial effects of Rainwater Harvesting and the Government departments, NGOs, industries and individuals are now involved in this task of Rainwater Harvesting. Several government departments have issued separate guidelines for the implementation of Rainwater Harvesting by their respective departments. It is, therefore, considered necessary, at this stage, to issue comprehensive guidelines to coordinate the activities of various agencies involved in Rainwater Harvesting to maximize the benefits and bring about synergy. 1. Nodal Department: The Municipal Administration and Water Supply Department shall be the Nodal Department for coordinating the efforts of various Government departments and agencies. 2. State level Coordination Committee: There shall be a state level coordination committee to review, monitor and issue policy directives to implement the programme of Rainwater Harvesting. The Chief Secretary will be the Chairman of the committee and the secretary, Municipal Administration and Water Supply department, will be the member-convener of the committee. 3. District level Coordination Committee: There shall be District level Coordination committees under the chairmanship of District collectors to guide, monitor, review and coordinate the activities at district level. 1. All Government departments/ Public Sector Undertakings/ Aided Cooperative institutions buildings constructed hereafter shall provide for Rainwater Harvesting. 2. All departments shall prepare an action plan for equipping the existing buildings of the departments/ Public Sector Undertakings/ aided/ cooperative institutions with Rainwater Harvesting structures, within a period of 3 years. 3. Rented buildings occupied by the government departments/ Public sector undertakings shall also be provided with Rainwater Harvesting structures and the owners of the rented buildings shall be asked to complete the task within a period of 3 years. 4. The buildings mentioned in the 3rd point provided with Rainwater Harvesting structures, shall prominently display a signboard approved by the Municipal Administration and Water Supply department for this purpose, indicating that the building is provided with Rainwater Harvesting structures. Both persuasive and legislative measures shall be used for ensuring the provision of Rainwater Harvesting structures in all buildings. IEC is an important component in persuading public to adopt Rainwater Harvesting. As they are the direct beneficiaries of these structures, more information dissemination will be sufficient to make them construct Rainwater structures. While the Chennai Metropolitan Water Supply and Sewage Board will be the nodal agency for the IEC campaign within the Chennai Metropolitan area, the respective district collectors shall coordinate the IEC activities in the districts. 1. The Chennai Metropolitan Development Authority, all Municipal corporations, Municipalities, Towns Panchayats and the Directorate of town and Country planning shall approve by layout plans, building plans, etc., and leases of all building plans for new buildings only after confirming the inclusion of provision of Rainwater Harvesting structure in the proposed plans. 2. In the case of existing buildings efforts should be made by local body authorities to ensure that Rainwater Harvesting structures are put up in the buildings at the earliest. 3. No building or structure with roof shall be given permission for construction in the state, henceforth, without adequate provision for Rainwater Harvesting. 4. Water connection and Sewer connection shall not be given to any building which does not have Rainwater Harvesting structure. 5. Building that does not provide for Rainwater Harvesting either in urban or rural areas shall not be hereafter assessed to property tax. 6. Huts and thatched structures put up by families living below the poverty line shall be exempted from the above provisions. 1. TWAD board shall identify locations suitable for ground water recharge that would benefit drinking water resources. 2. Similarly the water resource organization shall prepare a list of ideal locations for putting up groundwater recharge structures that would benefit underground aquifers and irrigation wells. 3. All department that construct water holding structures shall consult TWAD board/ Water Resource organization before taking up such works to ensure that such structures are put up in areas which will yield maximum benefits. 4. No water holding structures, like, tanks, ponds, swamps, etc., shall be converted for other purpose, nor shall their supply courses blocked or converted for any other purpose unless specifically permitted by the government or the competent authority. 5. The departments/ agencies responsible for the maintenance of the water holding structures shall ensure that the capacities of these structures are not reduced either because of encroachment or siltation or being put to alternate use. 6. Construction of runoff harvesting and runoff arresting structures in the flood prone areas should be accorded priority and a list of such locations should be prepared by the Water Resource organization in consultation with the special commissioner for Revenue Administration. 7. Storm water drains provided by the local bodies in the urban areas should ideally convey the storm water into temple tanks/ponds within the urban areas or should be let into a water body in the vicinity of the urban area. In the places where storm water is drained in the river/ water course, storm water drains must be so designed to inject the maximum quantum of storm water in to the ground before they outfall into river/ watercourse. 8. Involvement of local community and stake-holders in the maintenance is the best way to ensure the optimum maintenance and utility of these structures and the departments and agencies which construct these structures shall involve them from the planning stage itself and also ensure that the responsibility of maintenance of these structures is entrusted to them. In 2002, the Ahmedabad Urban Development Authority (AUDA) had made rainwater harvesting mandatory for all buildings covering an area of over 1,500 square metres. According to the rule, for a cover area of over 1,500 square metres, one percolation well is mandatory to ensure ground water recharge. For every additional 4,000 square metres cover area, another well needs to be built. In order to conserve water and ensure ground water recharge, the Karnataka government in February 2009 announced that buildings, constructed in the city will have to compulsorily adopt rain water harvesting facility. Residential sites, which exceed an area of 2400 sq ft (40 x 60 ft), shall create rain harvesting facility according to the new law. In 2007, Port Blair Municipal Council (PBMC) directed all the persons related to construction work to provide a proper spout or tank for the collection of rain water to be utilized for various domestic purposes other than drinking. As per the existing building by-laws 1999 the slab or roof of the building would have to be provided with a proper spout or gutter for collection of rain water, which would be beneficial for the residents of the municipal area during water crisis. Rainwater harvesting has been made mandatory in three storied buildings (irrespective of the size of the rooftop area). All new water and sewer connections are provided only after the installation of rainwater harvesting systems. The Kerala Municipality Building Rules, 1999 was amended by a notification dated January 12, 2004 issued by the Government of Kerala to include rainwater harvesting structures in new construction. The Central Ground Water Authority (CGWA) has made rainwater harvesting mandatory in all institutions and residential colonies in notified areas (South and southwest Delhi and adjoining areas like Faridabad, Gurgaon and Ghaziabad). This is also applicable to all the buildings in notified areas that have tube wells. The CGWA has also banned drilling of tubewells in notified areas. Rainwater harvesting has been made mandatory in all new buildings with an area of 250 sq m or more. A rebate of 6 per cent on property tax has been offered as an incentive for implementing rainwater harvesting systems. Rainwater harvesting has been made mandatory in all new buildings with an area of 1000 sq m or more. Rainwater harvesting has been made mandatory in all new buildings with an area of 300 sq m or more. Through an ordinance titled Tamil Nadu Municipal Laws ordinance, 2003, dated July 19, 2003, the government of Tamil Nadu has made rainwater harvesting mandatory for all the buildings, both public and private, in the state. It also warns the citizens on disconnection of water supply connection provided rainwater harvesting structures are not provided. Haryana Urban Development Authority (HUDA) has made rainwater harvesting mandatory in all new buildings irrespective of roof area. The CGWA has also banned drilling of tube wells in notified areas. The state government has made rainwater harvesting mandatory for all public and establishments and all properties in plots covering more than 500 sq m in urban areas. The state government has made rainwater harvesting mandatory for all buildings that are being constructed on plots that are more than 1,000 sq m in size. Managing freshwater scarcity constitutes to be one of the biggest responsibilities of governance everywhere in the world, and thus, local management of this resource is an indispensable component. Many countries have national water laws. In India, however there are no national laws as such, though there is a national water policy. The National Water policy 2002 is a cogent and comprehensive document and forms a basis that could be converted into a law. In India, under the constitutional set up, water is a state subject. In urban areas its governance rests with urban local bodies in their areas of jurisdiction as per the 74th constitutional amendment. The need for a policy framework for water harvesting systems arises mainly because the prevailing policy statements do not touch extensively upon the issue. There is a clear need to evolve a decentralized legal regime with regard to water, which empowers people and makes them real managers of resources. For promoting urban water harvesting, a policy should include a mix of incentives and penalties. Ground water exploitation is inevitable is Urban areas. But the groundwater potential is getting reduced due to urbanization resulting in over exploitation. Hence, a strategy to implement the groundwater recharge, in a major way need to be launched with concerted efforts by various Governmental and Non-Governmental Agencies and Public at large to build up the water table and make the groundwater resource, a reliable and sustainable source for supplementing water supply needs of the urban dwellers. Recharge of groundwater through storm run off and roof top water collection, diversion and collection of run off into dry tanks, play grounds, parks and other vacant places are to be implemented by Special Village Panchayats/ Municipalities /Municipal Corporations and other Government Establishments with special efforts. The Special Village Panchayats /Municipalities/Municipal Corporations will help the citizens and builders to adopt suitable recharge method in one’s own house or building through demonstration and offering subsidies for materials and incentives, if possible. Tags: 74th constitutional amendment Government’s Public Policy Decision ironical situation LEGISLATIONS ON RAINWATER HARVESTING National Water policy 2002 Rain Water Harvesting as a Government Policy Rainwater Harvesting systems of rain water harvesting Why Rain Water Harvesting? A piece of land allotted to me by revenu department during chakbandhi process.this land in johads (pond) Kitta, but today’s time there is a park ,a government office &land alloties are right holders. There is not a sign of a johad since a long time not a single drop of water any where.so my query is that this allotment is right or wrong to me .johads kitta can be changed or not because at present time there is no sign of a johad(pond). 102 queries in 0.218 seconds.